Welcome to the December 2018 issue of The Bullet. From what I’ve seen, the deer harvest this year seems to be up all over the country. That’s a good thing I guess but we need to remember that these things seem to cycle up and down. Down years are followed by up years and vice versa. Nature seems to have a way of balancing itself out. We just need to help it along sometimes. Is there is anything else to do this month besides hang Christmas lights or chauffer the wife around while she shops? I’d have to say yes there is! Waterfowl hunting is in full swing. Upland game season is full of opportunities to go after pheasants, quails, squirrels, rabbits and even doves. And don’t forget about all of the trapping going on for coyotes, raccoons, fox, otters, bobcats, wolfs and even skunks. Get out and enjoy yourself as we wrap out the year. Enough said. Let’s get to it. Enjoy the two hundred and eighteenth issue of The Bullet. Until next month, J. E. Burns, Editor-in-chief. BACKWOODS TRIVIA: See if you know the answer to this question. Why do a deer's eyes seem to glow when caught in our headlights? * Melt the butter in a large skillet. Add the meat, season with the seasoning salt and pepper. Slightly brown on all sides. * Add the onion and celery. Cook until soft and meat is browned. Remove and drain if necessary. * In a bowl, mix the soups and water together. Mix in the rice and veggies. Season to taste with salt and pepper. * Place everything in a casserole dish and stir together. * Bake at 350 degrees for 30 – 40 minutes or until the rice and meat are tender. * Serve with the crispy jalapenos sprinkled on top. Thanks to Duffy B. for this recipe. See more moose recipes on our site at www.backwoodsbound.com/zmoose.html. Don’t settle for an ordinary looking plaque! Go one better and order your AFTER THE SHOT Trophy Plaque today. Prices start at $32.95. Don’t wait, order today! As cold temperatures begin to make ice on Minnesota lakes, ice anglers and spearers are gearing up for winter fishing action. For many, winter is a time to seek out the eager-to-bite northern pike. This will be the first ice fishing season of new northern pike zone regulations throughout Minnesota, according to the Department of Natural Resources. The new regulations went into effect in May 2018 and created three distinct zones. While not designed to manage for trophy pike, the new regulations are meant to move pike populations to a larger size more desired for table fare, particularly in the southern and north-central zones. The move toward new regulations was a response to anglers’ concerns about the over-abundance of small, hammer-handle pike in much of central to north-central Minnesota; the low numbers of pike in southern waters; and a desire to protect large pike in the northeastern part of the state. Anglers: Limit of 10 northern pike, but no more than two pike longer than 26 inches; all from 22 to 26 inches must be released. Spearers: Limit of 10 northern pike, only one between 22-26 inches and 1 over 26 inches; or, only two over 26 inches. Anglers: Limit of two pike; anglers must release all from 30 to 40 inches, with only one over 40 inches allowed in possession. Spearers: Limit of two pike; only one northern pike over 26 inches. Anglers and spearers: Limit of two pike; minimum size 24 inches. The new northern pike regulations apply to inland waters but do not affect border waters or individual lakes, rivers and streams that have their own special regulations for northern pike. Special pike regulations are in place on about 95 waters and always take precedence over statewide regulations. Anglers and spearers should always research the lake they are fishing and must be prepared to reliably measure their fish. Waters with special regulations are identified in the fishing regulations booklet and with signs posted at public accesses. Northern pike are found in nearly every Minnesota lake and stream. Pike are voracious predators that are relatively easy to catch because they willingly bite shiny lures and live bait, such as minnows. Their sharp teeth can easily cut fishing line so many anglers use a steel leader ahead of their hook so they don’t have to re-tie hooks, jigs or lures. Early ice often is the best time to go as the fish seem to be more active, and it’s easier to cut the hole in the ice. Look for moderately shallow water with aquatic vegetation close by for the best action for pike. New anglers often shy away from harvesting northern pike because of their reputation as a difficult fish to fillet because of their Y bones. Dozens of instructional videos, often created by Minnesota resort owners and anglers, are available on YouTube and can be a great source for techniques to easily remove the Y bones from northern pike. For more information about the new zone regulations, visit www.mndnr.gov/pike or contact a local area fisheries office. Contact information can be found in the fishing regulations booklet, available online at www.mndnr.gov/regulations/fishing . Be sure to visit https://www.dnr.state.mn.us/ for information on all of the great outdoor adventures in Minnesota. Save 30% on ANY order through December 31st. Get ready for the Holidays and stock up this month! ANY design can be made into an ornament and it’s a great way to recognize a special event! Baby's 1st Christmas, Our first Christmas, Anniversary, or even "My first deer" and they’re now only $4.19 each! (regular $5.99) There is a $1.00 upcharge if the design is taken from a picture. Plan ahead for Christmas parties! Visit our web site for ideas and order before December 18th to get your order before Christmas. The color of all items can be changed to suit your needs! We can also make custom charms from your photos! Just send us a picture and we’ll make a charm from it. It’s easy. Place your order now so you’ll be ready for the celebrations. Sale ends November 30, 2018! FUN FACT: The image of Santa Claus that we know so well was created by Coca-Cola for an ad campaign in the 1930's. Haddon Sundblom was the artist who drew Santa Claus jolly and round while his eyes twinkled with joy. For 35 years Santa appeared in a new pose in the Coca-Cola advertisements. This version of Santa that we all know and love captures the essence and spirit of Christmas. HUNTIN' TIP: Even though winter is just starting and there is still a lot of deer hunting to do, the spring turkey season will be here before you know it. Now is the time to apply for those permits! Deadlines are fast approaching! Find links to all of the states DNR’s at http://www.backwoodsbound.com/stgamedepts.html for information regarding your state’s application process. The temperatures are dropping but the hankering for a hot bowl of chili is rising! And nothing tames that hankering better than that delicious, hearty tasting chili made with Backwoods Bound Chili Seasoning Mix. Its unique blend of herbs and spices makes a great pot of chili the family will love with NO added fillers or MSG. * Place the soup in a crock pot. Place the rabbit on top. * Cook on low overnight or until the meat starts to fall off the bone. * Remove the meat and allow to cool. Then remove the meat from the bones and cut into chunks. * Brown the rabbit and the sausage together in a large skillet. Drain. * Stir in the water, olives, basil, garlic powder, seasoning salt, oregano, sage, pepper, minced garlic and onion flakes. * Bring to a boil, reduce heat and simmer 15 minutes stirring occasionally. * Stir in the marinara sauce and remove from heat. * Place a layer of the meat/sauce mixture in the bottom of a 9" x 13" baking dish. Cover with a layer of dry noodles. Spread a thin layer of the ricotta cheese on top of the noodles. Sprinkle on a little mozzarella. Cover with another layer of sauce. * Repeat the layering ending with the meat/sauce mixture on top. Reserve a ½ cup of mozzarella. * Bake for 45 minutes. Check after 30 minutes. Lasagna is done when you can easily stick a knife through the middle. * Sprinkle on the rest of the mozzarella and cook another 10 minutes for cheese to melt. * Remove and let rest 5 minutes or so. Our thanks to Brian Potts for sharing this recipe. For other rabbit recipe ideas, visit our site at www.backwoodsbound.com/zrabb.html. I am not an avid predator hunter, but I have killed my fair share of coyotes while hunting and scouting and just enjoying the outdoors. The season is open year round on the small prairie wolves in Oklahoma and while I won't shoot one during the year when they are denned up and having pups, they are fair game the rest of the year. Over the years I have seen many wonders though. Most recently as I was going to my bow stand, I turned in under the mountain on the southernmost edge of my property and a half grown coyote ran out in the road in front of me and sat down. I stopped, bow in hand and I started knocking an arrow and he sat there looking at me like he was trying to figure me out. When he cocked his head to one side and yipped like any other dog would I laughed and put my arrow back in my quiver. "You better get up the woods! The next human you meet might not like you so much," I said with a laugh. The coyote stood up as I sat down and gave the 4 wheeler gas. He ran to my right on up the hill and out of my headlight. As I rolled on down the road he ran out in the light and stood there and watched me some more. 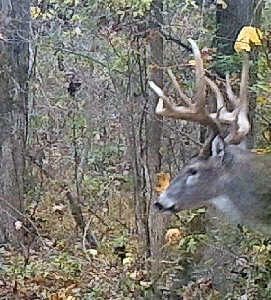 When I got even with him he ran along ahead of my 4-wheeler and stopped at the edge of the first food plot. I stopped and we just looked at each other. Finally I took off again and as I rolled past him he just sat there and looked at me. Several years ago in a tree stand I watched 11 coyotes come through hunting as a pack. I have never seen that before or since, but over in the northern part of Haskell County a man killed a female timber wolf that the game department believed had been part of a fur farm and turned loose when fur prices went to nothing. She had had several litters of pups and they determined her to be an old wolf and in the wild for a few years. The coyotes have gotten big and they run in packs occasionally. Hmmmmm. Another time I was driving down the long driveway to my in-laws home and I saw a life and death race! A beautiful gray fox was racing across the hay meadow like his bushy tail was on fire! Behind him running just as fast was a coyote intent on killing his distant cousin. Slamming the brakes on the truck, I peeled my ever-present SKS from the back seat, jumped out and slammed three shots at the coyote as fast as I could pull the trigger. He tumbled head over heels and the fox got away unscathed, never looking back to see if he was safe until he made it to the woods along the big pond. I have only seen a gray fox in the wild four times. The first time I was in high school and I watched one just out of range of my .30-30 catching mice in a brush pile along a new pipeline. Another I saw was crossing a ridge, taking a stroll as though he was out for his Sunday walk. The third time was the time I just wrote about. And the fourth…… A couple years ago I was hunting this food plot down the hill from my in-laws commercial hog barns. It was a minimum 135 yard shot to the food plot and the far edge was right at 200 yards. Normally I hunted this food plot with a 7mm Rem Magnum or my .308 Winchester. For some reason I cannot explain I picked up my daughter's little Savage Rifle in .243 Win to hunt the plot that evening. The .243 is a good cartridge, but I definitely had better ones for the distance I was shooting. Still, it is what I took. The Bermuda grass is thick on the side of the natural earth dam holding tanks and I always rested comfortably that far above the food plots. As I sat there I could see two young does eating at one end of the plot. They were yearlings, their mama sending them away as breeding season came into play in the deer world. I had seen them several times before and while I would quickly take a big mature doe, the two young ones were as safe as they could be. The problem with this place was I had taken more than one nap there. The evening was pretty darn cold, but I was bundled up warm and I felt my eyelids grow heavy. I had my shooting sticks up, but the rifle was in the grass beside me propped up on my backpack. If you have spent a lot of time in the woods you know that when you feel like you are being watched, you normally are. I moved my head around slowly, looking to either side as my hand had moved to my .44 magnum revolver. This would not be the first time I had a doe on top of me. Looking straight down the hill below me I saw two eyes peering up at me through the brush. It was a gray fox and he was no more than 25 yards from me, his sharp face barely visible through the thick Sumac and Indian grass on the side of the hill. I was in full camouflage, the orange vest I was wearing was camo-orange and I knew that the fox should not be able to see me, but he might have seen me move before I had seen him or became aware of him. I froze, refusing to make eye contact. As I sat there the fox walked out of the brush to the flat bench below me and lay down in that thick Bermuda grass. As I watched in amazement, he curled up and went to sleep. Slowly I moved my hand to the rifle, lifting it gentle from the pack, freezing in place each time the fox raised his head and looked around before putting it back down and dozing some more. It took me a full 20 minutes to get my rifle in place. He was beautiful and I told myself I would not shoot him unless I could do it without tearing him up. I sat there with the rifle ready for another 10 minutes before he finally got up and scratched. I held the crosshairs on him and then he leaned forward and stretched. I shot him right behind the leg, straight through the heart and he nosed forward into the grass. I sat there, glancing at the now empty food plot. Gathering up my stuff I carried them up the steep embankment and to my truck at the hog house. Walking back I felt a strange mix of sadness and elation at taking this animal. Standing by the fox I marveled at how beautiful this small predator was lying there in the grass. I wish I had a video camera to capture the entire nap. I picked him up gently and carried him to the truck. Laying him on the tailgate I felt of the soft fur and already knew how I wanted the taxidermist to mount him. Up until that point I had never done a head mount or a full body mount of any animal. I have no desire to kill another fox and to me that makes this one an even more special trophy. He sits over my fireplace now -- vigilantly guarding my living room. I hope to take a bobcat this year to go on the other side. The Red River Gorge Zipline continues to be one of the most popular destinations in Kentucky! 2017 was a fabulous year and we’re looking for another great time in 2018! The Zipline is located in the World Famous Red River Gorge about 60 miles east of Lexington in the Heart of Eastern Kentucky near the Natural Bridge State Park and Daniel Boone National Forest in Rogers, Kentucky. There are five Zip-lines to choose from with the two highest being 350 feet tall, being the fastest, 50+ mph, and the longest at 1,200 feet and 2,000 feet. These we like to call Racing Lines! Bring your camera or rent a GoPro from us to record your experience. Visit our web site for all the details including information about the lodges, cabins and camping available to you. FISHIN' TIP: Be sure to check for any new regulations at your favorite fishing spot. New rules usually go into effect when the New Year starts so be up to date. We need your stuff for the upcoming winter issues! Everything is needed from recipes to trail camera pictures to hunting stories! Send all of your stuff in now so we can sort through it and get things lines up. Send everything to mail@backwoodsbound.com. Thanks and we look forward to getting them! Things are bustling in the shop as orders for our After The Shot Trophy Plaques roll in daily. Orders come in and plaques go out. Some designs that have gone out in the past week include Montana, Wisconsin, Oklahoma and West Virginia. Go to www.backwoodsbound.com/ats.html for all the information on our line of After The Shot Trophy Plaques. And remember we specialize in custom designs! The cost of doing business is always rising so we had to increase the prices on all of our plaque designs recently. The cost of material had gone up a couple of months back and we held the line as long as we could but finally had to implement an increase. Unfortunately we’re probably going to be increasing shipping rates soon too. So if you’re thinking of placing an order you should do it soon. Deer season is fast approaching so place your ad now! Here’s a sequence of pictures of a super nice southern Illinois buck taken a couple of weeks ago. 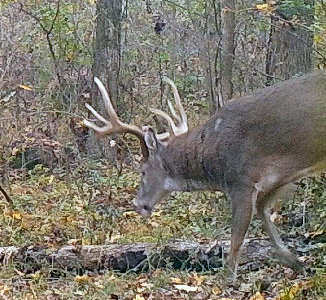 He survived the first gun season so hopefully he’s still out there for the muzzleloader season. Pictures from Editor James Burns’ camera. * Pre-heat oven to 425 degrees. * Lightly coat a deep pie dish with non-stick spray and place one pie crust in it. * In a large bowl, mix together the brown sugar, sugar, flour, lemon juice, cinnamon, nutmeg and cloves. * Add the apples and raisins. Mix until well coated. * Spoon apple mixture into pie crust. * Place second pie crust on the top of the pie and pinch together the edges. Trim edges if necessary. * In a small bowl beat the egg. * Brush the top of the crust with the beaten egg. * If desired, sprinkle on a little sugar and a dash of cinnamon on the top of the pie. * Bake until golden brown, about 35 - 40 minutes. * Cool on a wire rack for 30 minutes. Best if sliced warm. Thanks to Charlie Bartlett for sending in this recipe. For more delicious dessert recipes to try visit our site at www.backwoodsbound.com/zdess.html. ANSWER TO BACKWOODS TRIVIA:There is a shiny blue-green membrane called the tapetum lucidum attached to the retina to enhance low-light vision. It is the reflection from this membrane that makes for the apparent glowing of the eyes.